More than 2 million Somalis continue to endure protracted situations of displacement, which have lasted for more than two decades; approximately 1.1 million people are internally displaced in Somalia and nearly 1 million are refugees in the neighbouring countries of Djibouti, Ethiopia, Kenya, Uganda and Yemen, including some 396,000 in Kenya alone. Given the recent security and political gains observed in parts of Somalia, and in the context of the Government of Kenya’s decision to close the Dadaab refugee camps, the Tripartite Commission for the Voluntary Repatriation of Somali Refugees living in Kenya met in Nairobi on 25 June 2016 to discuss the operational modalities of ensuring a safe, dignified, voluntary return and sustainable reintegration of Somali refugees from Kenya. An Enhanced Plan of Action for the Voluntary Return and Reintegration of Somali Refugees from the Dadaab Camps in Kenya (hereinafter “the Plan”) was proposed by UNHCR to address the concerns expressed by the Government of Kenya, while ensuring that returns take place voluntarily and in conditions of safety and dignity as set out in International Law and reiterated in the Tripartite Agreement Governing the Voluntary Repatriation of Somali Refugees living in Kenya, signed by UNHCR and the Governments of Kenya and Somalia in November 2013. Provision of community-based reintegration support in return areas in Somalia. This supplementary appeal presents the additional requirements of the Plan to respond to the Somalia situation in Kenya and Somalia that were not foreseen in UNHCR’s ExCom-approved 2016 budget. For the response inside Somalia, it should be noted that the Somalia Humanitarian Response Plan (HRP) for 2016 mainstreamed the inter-agency requirements within the respective Cluster chapters for the return and reintegration of some 69,000 Somali refugees from Ethiopia, Kenya and Yemen, with total requirements of USD 80 million. 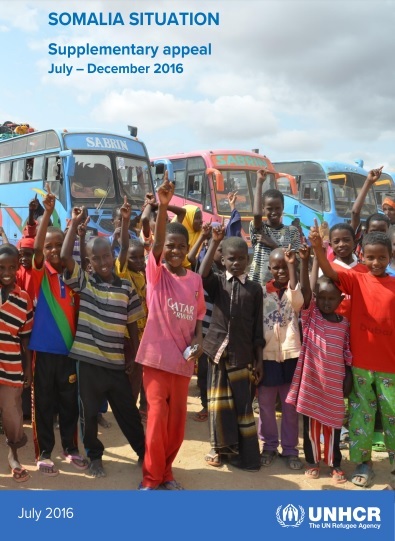 However, the UNHCR component of the HRP for return and reintegration activities is not sufficient to address the new needs for an enhanced repatriation from Kenya to Somalia, which include additional requirements related to the expansion of reception facilities, the increase in repatriation grants, the additional shelter support needed and financial assistance targeting people with specific needs. In Djibouti and Ethiopia, UNHCR has already planned responses to the needs of Somali refugees under the Somalia situation within their respective 2016 programmes. Additional information on UNHCR’s existing response to the Somalia situation in these two countries is included as an annex to this appeal. In Uganda and Yemen, UNHCR’s response to the needs of Somali refugees is also included in the 2016 country programmes, as presented in UNHCR’s Global Appeal 2016-2017 for Uganda and in UNHCR’s Global Appeal 2016-2017 and its supplementary appeal for the Yemen situation (February 2016). In Uganda, some 36,600 Somali refugees continue to benefit from multi-sector assistance services in the settlement and targeted protection and livelihood interventions in urban areas. Yemen is a traditional migration and transit hub for migrants and refugees from the Horn of Africa and to date, Somalis have been granted prima facie recognition. Some 253,950 Somali refugees benefit from the range of services that are provided, including legal assistance, cash assistance, health care and education services. While most of the refugees live in urban/peri-urban settings, UNHCR manages a camp in Kharaz, in the south of the country. Owing to the continuing emergency in Yemen, no organized return is foreseen in 2016. It is foreseen that UNHCR will request an extension of the supplementary budget for the Somalia situation for implementation in 2017 after the conclusion of the 67th session of the Executive Committee in October 2016.